Baby songbirds learn to sing by imitation, just as human babies do. 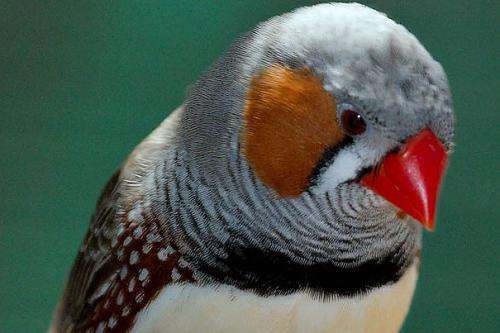 So researchers at Harvard and Utrecht University, in the Netherlands, have been studying the brains of zebra finches—red-beaked, white-breasted songbirds—for clues to how young birds and human infants learn vocalization on a neuronal level. While a baby bird mimicking the chirps of his "tutor" may seem far removed from human learning, the researchers at the two universities found that the songs of the birds and human language are both processed in similar areas on the left sides of the two very different brains. The discovery was published last month in the Proceedings of the National Academy of Sciences. "You need a number of different brain areas that together give rise to vocal behavior," says co-author Sharon Gobes, a researcher in Harvard's Department of Organismic and Evolutionary Biology and a professor of neuroscience at Wellesley College. "You need an auditory area to perceive and store sounds, and a motor area to produce them. So evolution finds a solution, probably the simplest, which is why both [bird and human] species may have evolved lateralization." Songbirds are of particular interest because they do something few animals can do: learn to speak. Our nearest ancestors, apes, don't learn new vocalizations—theirs are inborn—so we can't learn about language by studying their brains. But songbirds learn to sing as humans learn to talk—during a critical period, by imitating a parent. So by studying birdsong, we may gain insight into the underpinnings of human speech. Why song and speech are lateralized to the left in both songbirds and humans remains a mystery. But Sanne Moorman, a doctoral student at Utrecht University and first author of the study, has some ideas. "If you only use one hemisphere for language or song, you have more space left for something else," she said. Evolution seems to have built our brains and the birds' in the most economical way. Probing Question: How do songbirds learn to sing? My pet theory on lateralisation is that prior to say, specialised speech areas and so on, there's another, more fundamental dynamic at play: The idea is that all the information we sample has to be delineated into temporal and spatial frequency components, and that this is done via "temporal integration windows" ranging from the very small, ms range, up to much larger sizes of seconds or more... and that there's a natural predilection for these to self organise from left to right (usually smaller on the left, progressing to larger on the right), across the cortex. Thus lateralised faculties naturally slot into areas that already best match their normal distribution of spatial vs temporal freq. components. In short, magnitude per se (numerical or abstract) favours a left-right representation, culminating in a left-side dominance for spatial components, & right-side for temporal. This allows for efficient parallel processing of info in both domains w/o conflicts between hemispheres..